I just found this so you don't need to send me the link. Never heard of this before and I'm quite intrigued by it. LOL because I just realized you're probably in bed sound asleep when I'm writing you these comments. yes, i was dead to the world. actually, perhaps i picked up your thoughts because i dreamt about food and cooking all night long. it was a restless slumber. What a tasty sounding drink. I'm thinking chai but wondering exactly what the flavour of an orchid tastes like? This drink sounds like it could form the plot of a romance novel! I haven't been to Badde Manors or Glebe Markets in ages - but now I have a great reason to pay them a visit. Well it looks chai but I figure probably no where close in taste. I am learning so much from reading all this. Thank you. it's not as spicy and flavoursome as chai. to be honest the sahlep doesn't have a very strong flavour on it's own. it's more of a sweetness and thickness. without the cinnamon i imagine it would be a little dull, but there's still something very comforting about it. Nice to present Sahlep as such a cool, fashionable drink. Unfortunate for the local orchids, for they already on the point of extintion. However they grow in colonies with a few 1000 a time, when they are pulled out, the fungus they live on dies. After 2-3 years time that full colony of orchids forever will be wiped out. patrick, i think it's very unfair to blame the extinction of the orchids on tourists. turks, and most of the mediterranean, have been eating and drinking orchis latifolia / orchis anatolica products since the time of ancient rome and as an ingredient it is fairly entrenched in traditional turkish cooking. i think this explains the problem a lot more than “tourists in istanbul”. is this really about saving the orchid or is this a blame game so you can have a go at tourists? if you are genuine, then surely talking about the orchid’s extinction and encouraging the preservation of its habitat will increase the opportunities to protect it? in australia, where certain animals and plants have been close to extinction, huge campaigns have been launched to increase their profile and make people aware of the issues surrounding them. the attention draws allies. i do understand that, in poverty stricken areas, people are not concerned with the preservation of an orchid when they just want to make a living, but to blame tourists is naïve, misguided and bordering on intolerant. surely turkey’s internal agricultural policies have more of an impact than tourists? it is highly offensive that you found it necessary to write to me in such a sarcastic way when all you needed to do was express how important the preservation of these orchids is and that you feel promoting sahlep exacerbates the problem. you did not need to be so rude. i fear your style of communication needs significant improvement if you wish people to hear your valuable message more clearly. There are vendors, here in Greece, that sell "salepi", a cup is about two euro. I love the taste, and as much as I have tried, I couldn't make the beverage myself. 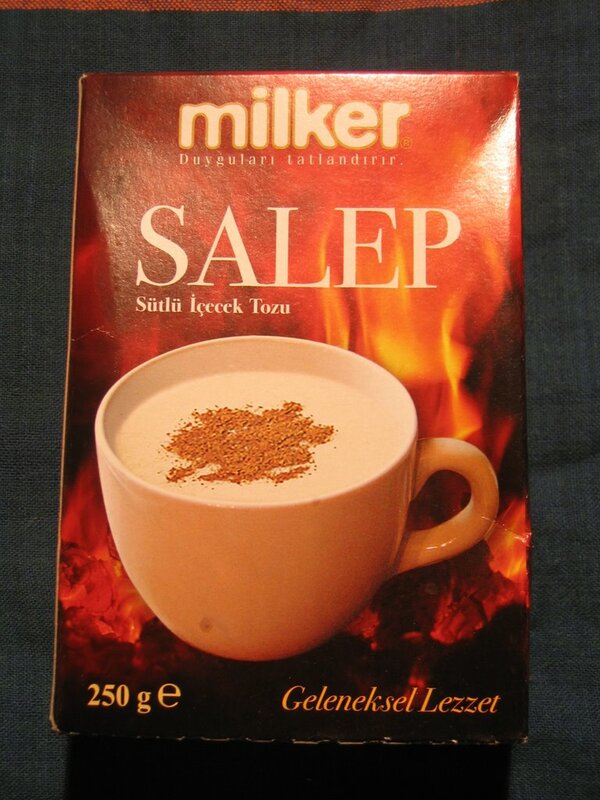 I managed to get hold of some salep powder, but the guy I got it from did not specify how to make it. Do you know of any recipes to make salep bough in bulk, rather than packed? Salep is popular in Egypt, specially in the winter months. Here is some background and the Egyptian Salep drink recipe. Thanks for the info, just a quick correction though...the band was called Aphrodite's Child. I was listening to their album & reading the liner notes and, well, that's how I ended up here! Thanks again! However there may be a silver lining. Since this industry is so dependent on the sahlep plant, they know very well that they will go out of business when it becomes extinct. So they have been trying to find a way to grow it artificially. I remember reading something about it, but not sure how successful they have been so far. Orchids used in industrial production of sahlep are grown artificially. With good conditions made for them their taste is a bit ticker than natural orchids, but unlike traditinal methods nowadays they use flavor and starch from wheat and patatoes for thickness. Sahlab which would be the arabic pronunciation, has been known to and used by the arabs for centuries, and curious enough, most recipes cited as having turkish origin, whether for the drinks or the ice creams, were known to the arabs for much longer. This was just to put things in their right order, as so many things are wrongly attributed to the turks, who we should not forget, being an invading nomadic and barbaric people not long ago, did not have much of a stable culture and appropriated most things from the people they came to invade and come to live in neighbourhood, such as the arabs, persians, armenians. greeks and the balkans. I guess people should be better informed themselves about realities before they adopt popularised information for truth. Nothing against the turks,,, but as the french say, "rendons a Cesar ce qui appartient a Cesar" (Let's return to Ceasar what belongs to Ceasar). this is for anon who went on the anti-turkish rant, all i can say to you is "yawn". every single culture in the entire world has adopted words, inventions, foods etc from their neighbours and evolved them into their own. to make out the turks are the only ones who ever did this is ignorant and leads me to suggest you take your own advice and "better inform yourself" before adopting bigoted propaganda. you say the turks were "invading nomadic and barbaric people not long ago"? i don't know too much about the ottoman empire but i know they were certainly more excepting of the diverse religions and cultures under their rule than their european counterparts during the same period and surely more tolerant than many modern nations in turkey's current vicinity. and who cares about what they were. let's focus on what are they now? turkey is certainly doing better than some of their neighbours these days, who one could argue have reverted from civilisation into chaos over religion and perceived injustices of the past. all you wanted to do was have a go at turkish people. take it elsewhere. can anyone tell me why this simple little post on a nice warm drink turned into such a controversial hot bed?!?!? people, this is a food blog, not a political chat room. chillax. The seeds came only from breeded plants from professional production houses in france. Sahlep! Here in California we pronounce it as Sa-ha-laab. Is that how it is commonly pronounced? An Armenian barista who works for us introduced it to our menu as his signature drink, and I, for one, have never been the same. What I wonderful find!!!! We get the powder in very small quantities from a Grecian cafe which sells some interesting groceries, but if we are to truly provide it we need more supplies. Anyone know of a bulk or larger supplier? I have never heard about this drink. When I searched, I have come across this - "Turkish drink made from the starchy tubers of several members of the genus Orchis. It has a thickening effect on water, making kind of a hot chocolate consistency. 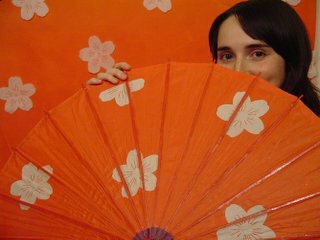 It's often flavored with rose water or other ancient sweeteners." But it's not clear to me why do some consider it is a stimulant! I was treated to this drink this past winter on a trip to Istanbul from the US. I was in love. There was no need to feed me any other food the whole time I was there. However, I was enjoying this wonderful drink with the addition of one major additional ingredient - a scoop of chocolate ice cream! YUM! Unbelievable. This truly made it a nectar of the Gods. 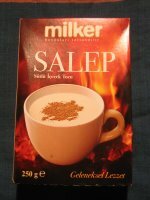 Would love to know where I can buy salep powder in Australia -either real or artificial...to make icecream. had it recently in Istanbul, and must try to recreate that wonderful moment. To the anonymous person above this message, I live in Australia and I just bought some salep powder from a Greek/international supermarket near-ish to where I live. Super pumped to try it now ahaha. The supermarket's called Colossus, it's in Melbourne. Hope that helps. Is there an address somewhere? Does your supermarket sell on the net Anonymous above my message? Thanks for this great article Anna. It is illegal to export real sahlep powder from turkey. So all you can find abroad is the instant powder. My 4-year old son is addicted to the real thing and can't sleep without it! I usually buy a small bag of it once a year in Istanbul and it lasts the whole year. But I feel really guilty about this like I was smuggling drugs. It looks like how I would imagine cocaine to look like! I really hope they manage to figure out how to grow it commercially. As mentioned, the orchid in question is sadly still listed as endangered. As it also seems quite difficult to cultivate the plant, finding a good salep-substitute still appears to be the preferred way to go for now. Actually the band's name is Aphrodite's Child and the aforementioned quote is on their album "666". I was researching sahlep due to the reference on the album.